Twelve renowned leaders testify to God's love (agape) breaking into their darkest moments. Compiled by prolific author Dr. James W. Goll,president of Encounters Network, international director of Prayer Storm, and founder of God Encounters Training. Goll loves to share the great joy of Jesus across all nations and this is abundantly clear in "What Love Looks Like" . As you read these remarkable testimonies you'll be reminded, or perhaps believe for the first time, that God really is showing love to a hungry world. Missionary, Heidi Baker, who together with her husband Rolland founded IRIS ministries in 1980. In 1996 Heidi was struck down with tuberculosis and pneumonia, despite her doctors advice she attended a healing meeting in Canada and there she saw a miraculous vision from Jesus showing her the thousands of children she would help. Preacher and Pentecostal bishop, Harry R. Jackson Jnr. whose ministry started following the death of his father. Now, with the help of his wife, he leads a 3000 strong congregation at Hope Christian Church. Missionary Jackie Pullinger, who set sail in 1966 following God's call to the Walled City in Hong Kong. Each and every account throughout the book is colourful with the love of God - encouraging you to love others in a life changing way. Begin to believe that once again the Church might be known for love. If you're feeling worn out, jaded, love-lorn or sceptical - pick up this book and be reminded that God really will pour his love out on you and through you. 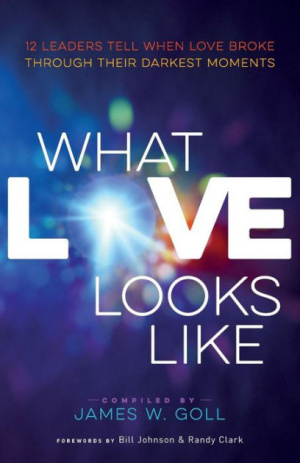 What Love Looks Like by Jim W Goll was published by Baker in September 2015 and is our 19974th best seller. The ISBN for What Love Looks Like is 9780800797744. Be the first to review What Love Looks Like! Got a question? No problem! Just click here to ask us about What Love Looks Like. and you'll begin to believe that it's possible to show a hungry world the kind of love the Bible promises.If you're feeling worn out, wondering if God can really pour out His love through you - read this book. These remarkable stories will inspire you to become an outlet of love. And not just any love. The beautiful agape love through which Jesus is changing the world.